Living off the land, Alaska Natives defend the world's largest salmon runs against the impacts of the world's largest gold mine, the proposed Pebble Mine. Address: 100 49th Ave W, Vancouver, BC. 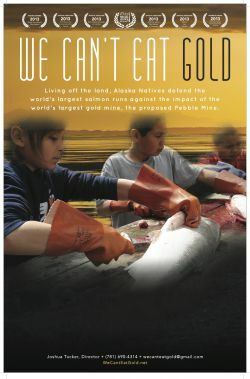 We Can’t Eat Gold opens a space for Alaska Native elders and youth to share their subsistence ways of life, before the U.S. government decides whether to permit Vancouver, BC based mining company Northern Dynasty Minerals LLC. to excavate a toxic open pit mine among the lands and waters in Alaska's Bristol Bay that Yupik and Athabascan tribes have called home for over 350 generations.